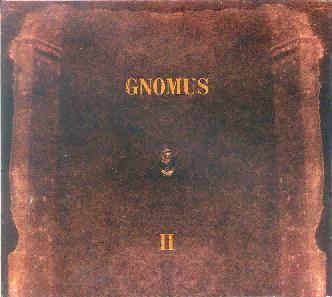 Finland’s Gnomus inhabits that very gray region that so many Scandinavian bands seem to fall into, a kind of musical purgatory halfway between ECM-ish avant-jazz and European progressive rock. Lots of alarming time changes, fragments of electronic atonality, angular melodicism reminiscent of RIO-style groups, and dissonant scale modalities thoroughly permeate the three extended pieces that make up II. The playing is precise and fiercely complex, yet at the same time spare and efficient, with Kari Ikonen’s keys and often aggressive synth leads usually in the forefront, providing much of the abstract tonal coloration to the band’s overall sound. The spirit of Art Zoyd, Univers Zero and Peter Frohmader looms ominously over these dark and brooding pieces, but the ghosts of Terje Rypdal and Jan Akkerman can be clearly discerned in the economical yet ethereal playing of guitarist Esa Onttonen. “Sirens” and “Hypnos” both spiral off into the nether realms of ambient jazz/fusion, with some amazingly deft drumming from Mika Kallo supporting the alternating guitar/synth solos that slowly build into some frenetic jams. “Trauma,” on the other hand, is more self-consciously avant-garde, similar perhaps to some of the work by Material, sans Bill Laswell’s trademark bass. There’s much to digest here, and repeated listening is therefore compulsory, yet also rewarding. II is both disquieting and hypnotic, like a cold troubled sleep from which it’s impossible to wake. Aficionados of Euro-jazz will especially appreciate the eccentric qualities of II, but fans of RIO chamber rock and avant-rock in general will no doubt find many subtle pleasures here as well. For more information you can visit the Fiasko Records web site at: http://www.fiaskorecords.com. Contact via snail mail c/o Fiasko Records; Tehtaankatu 19 H 41; FI-00150 Helsinki; Finland.